A beautifully created shared office space right in the heart of Nairobi, Kenya, Ikigai has attracted people from a cross-section of industries who value interaction and the possibility of collaboration with others but want to work in a highly professional environment. Based on a Japanese concept that means “a reason for being,” Ikigai is such a popular office venue, it has been expanded with converted mobile containers to meet the demand. 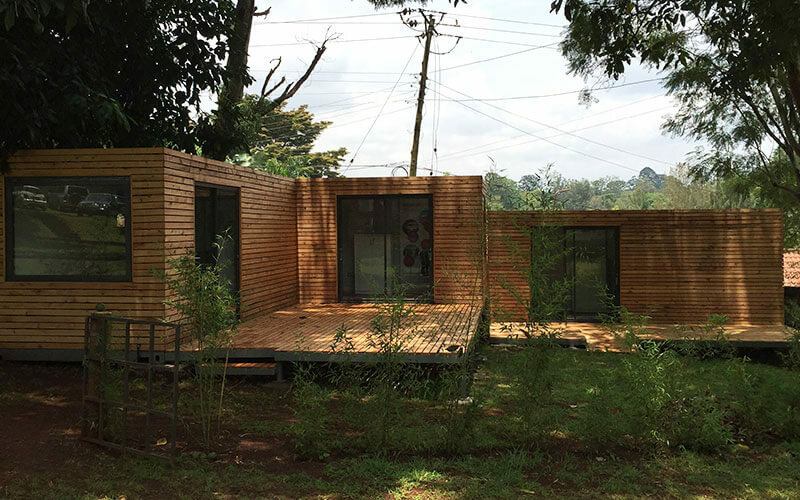 Founded by two passionate entrepreneurs, Wachuka and Nyambura, who believe in the collective greatness of the community, Ikigai is located on a beautiful property that boasts a huge, rambling, old house and lush green gardens. They lease the property and are bound to keep the house in its original form. They may not build any permanent structures on the site, which is why they have opted to expand using mobile containers that may be relocated later if need be. Private membership that offers a range of secure offices in the house, in adjacent studios, and in lovely converted shipping containers. Communal full membership that offers access to workspace but not private offices. Flexible membership that offers up to 10 days access per month for those who need more professional facilities from time to time. Meetup membership that provides access to boardrooms and other meeting rooms as well as outdoor spaces. All forms of membership offer high-speed Wi-Fi and there are communal areas in addition to the meeting spaces and boardrooms. Roasted Truth, an artisan barista-operated coffee bar established in one of the many converted shipping containers, and its adjacent coffee deck, is another perk for members. When the owners of Ikigai decided to expand their office space, there were several major challenges they had to consider, including the fact that permanent structures were not acceptable. 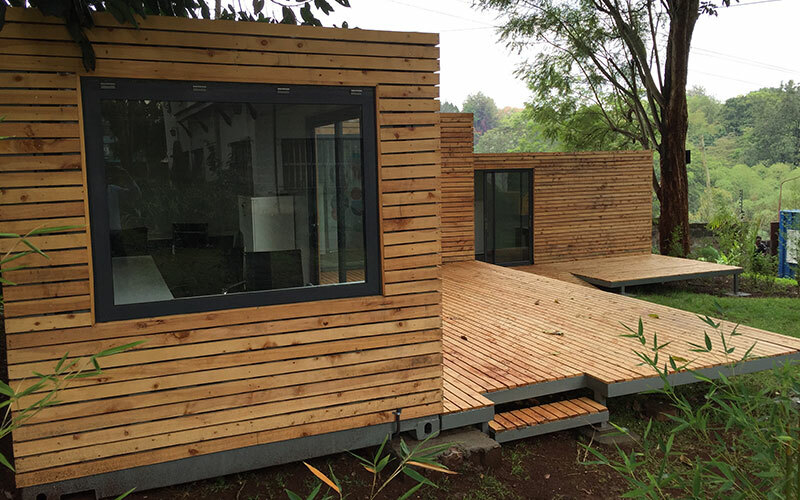 Aesthetics are important to the Ikigai team, and it was essential that if mobile containers were going to be used, these had to blend with the existing environment. Almar Container Group, which has operated in Kenya since 2010 and is now the country’s largest supplier of steel containers to the end-user market, was approached to undertake the project. One of the benefits would be the speed of delivery and Almar’s ability to move the mobile containers to another site later if required. First, they had to identify suitable areas for converted shipping containers. Then they had to design both a workable layout and container design based on this configuration. Ikigai needed big glass windows and doors incorporated in the design to facilitate both light and airflow. Almar’s designers achieved this by using double-glass sliding doors and lovely big tilting windows. The containers were also well insulated. PVC tiled flooring was chosen, and down-lighters were installed to meet the client’s brief for smart, modern, and functional office spaces. 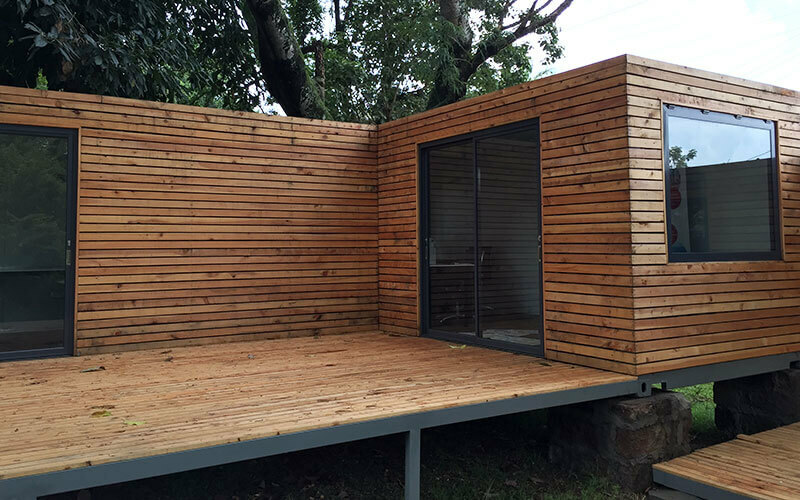 The exterior walls of the containers were covered with timber cladding that would blend with the garden environment and surrounding spaces. Ultimately, the project shows how effectively converted shipping containers can be used in an upmarket residential area. 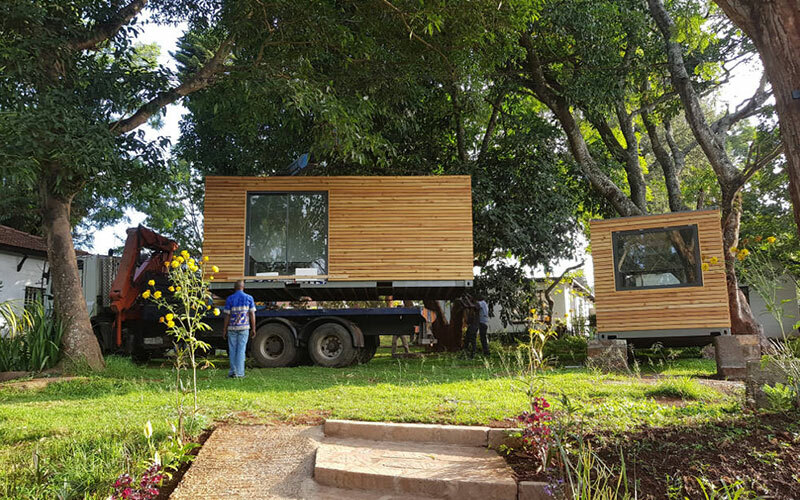 Whether you want accommodation for offices or boardrooms in upmarket converted shipping containers, mobile containers for traditional industrial office use, or steel containers that can be converted into living accommodation, Almar can help fulfil your needs in Southern Africa or the Middle East. Call us to discuss your needs or request a shipping container cost.